Uinta was my second chance. It is the place I feel is home and I will never stop being thankful for you and all you have done. Your belief that I am capable got me through the toughest year of my life. Uinta has changed my whole life. It has also helped me find the real me again. I love who I've become, I consider Uinta my home, always have and always will. It was like the family life that I never had. I didn’t know I was worth that much. I now realize that I am cared about. That some people actually want me and would never hurt me. I feel safe here. This is my home. Uinta has given me the chance to start over in life and learn about myself, my family and how to make positive friends. I will cherish my time spent at Uinta for the rest of my life. The reason why I think Uinta will help me is it’s home life style home, it makes me comfortable. Uinta has become my comfort zone and I honestly think it’s because of the way the program is set up. We have a house, real furniture, TV, beds, freedom, rec-activities, target skills, and therapy. It is truly a blessing to be here. It’s my home away from home and I love it here. Uinta saved my life and helped me find myself again. I am so much stronger and happier because of Uinta. There’s no doubt in my mind that Uinta saved my life, and made me a better person through what they taught me. I know that because of your guidance, I can go home and be successful now. All we though she was capable of achieving is now happening! This would not have been accomplished without the love and support she received at Uinta Academy. We are ever grateful for Uinta Academy and its incredibly talented and caring staff. You saved Lacey’s life and there are no words to express our gratitude. The transformation, more like a rebirth, has given this sweet young lady a second change for happiness, success and life itself. We visited two other programs in the area. They were respected and impressive programs, but neither of them had engaged owners that shared the passion that you bring to Uinta. Neither program felt like a home the way yours does. We are so grateful to God for putting angels like you in Gabi’s life. Naomi loved putting on the Greek play and reported that she had a really great time doing the project. She was happy that people laughed and she loved her acting part. I love the classical music appreciation. Tying in history, film, graphics and music together for the girls is incredible I have been trying to get my daughter to listen to classical music. I feel the expressive arts are so important to a young person’s life. These girls will have missed a very meaningful part of living life to its fullest, if you hadn’t taken the time and effort to awaken an appreciation and a love of theater, classical music, history and art. It is a very hard thing to turn your daughter over to anyone and especially hard for such an extended period of time. I know I did the right thing and Sarahcate really does have a second chance now at making good choices and having a very happy and successful life in whatever she wants to pursue in the future. I want to personally thank you and your team for everything you did for Lexie. You saved her life and we’ll be forever in your debt. I had fewer worries when she was with you knowing she was well cared for. She now has a great foundation to continue to move forward and make positive change, all thanks to Uinta. I can’t say enough good things about everyone. You have a great team. Not only are they very proficient, but you can also tell they are very caring and supportive of the young ladies. I marvel at everyone’s patience and professionalism when dealing with the girls and us parents! Thank you for helping our daughter find herself and her way back to her family. You guys were far different than a ‘cure’. You are the voice inside my head that provides direction in a world without signs, roads or even a map. And because of you we have survived, more than survived. Your work is a labor of love. We feel truly blessed to have found you and the Uinta team The parent workshop weekend (family weekend) opened our eyes to a world we did not know and we left with a much greater understanding of life at Uinta, and respect for the work and commitment that is invested in each and every girl that passes through there. Uinta is a safe, supportive environment for girls to do a lot of difficult work that they could not do at home. Uinta is truly first rate and their care and professionalism shows throw like a beacon of hope. Uinta will always be a special place along her journey, where she was supported, held accountable and succeeded. Uinta’s efforts are based in love and faith and with a genuine desire to help young women find their true selves. I know Hali’s life has been enriched in ways we never thought possible- with Uinta’s help she again has a bright future. Kayla’s transformation has been incredible due to all of the Uinta Staff. The dedication to their work and their sincere love for the students is very evident. Uinta has given our family the strength and skill to thrive. Through the thoughtful, rich and carefully tailored program, we are once again a family. We entrusted our daughter into Uinta’s hands. She was drowning. Little did we know that a family of “angels” was going to embrace her, teach her, and guide her to healthy rightful living. Uinta took our drowning daughter and taught her how to swim. Uinta has graciously accepted our daughter and others unconditionally. They have shown them love and compassion when they need it most. It is clear to me that something quite magical happens at Uinta. Every time I visit it just gets better. I am deeply impressed with the integrity of Uinta’s style and approach. Clearly they have a very wonderful vision and commitment that is making a real impact on their girls. 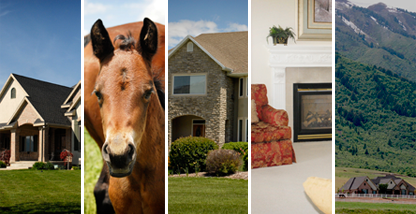 Uinta has the most sophisticated equine program in the residential treatment profession. You can trust Uinta to not give up on a student.